Ballarat and surrounds are blessed with many picturesque spots. 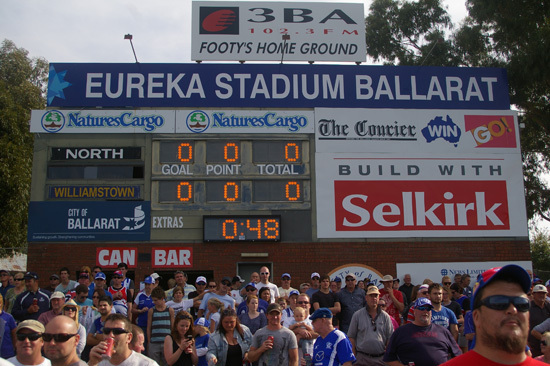 Eureka Stadium doesn’t rate as one of them. Close to the showgrounds and a Selkirk brick factory, with a railway line as a backdrop, the North Ballarat ground sits on the road to Creswick without much pomp, and very little ceremony. 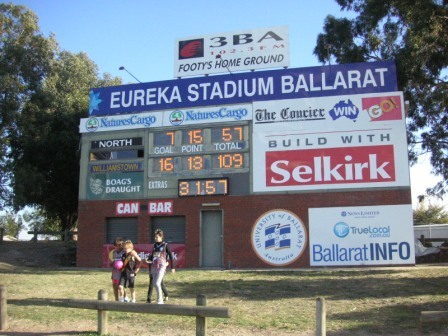 It doesn’t have the history of Ballarat’s Eastern Oval, nor the grandstand of City Oval, but this didn’t worry the mighty North Ballarat Roosters as they powered their way to three successive senior VFL premierships from 2008-2010. The low slung stand runs along one wing. It isn’t particularly grand in appearance, but its internal facilities certainly do the job. The club’s memorabilia display is very impressive. 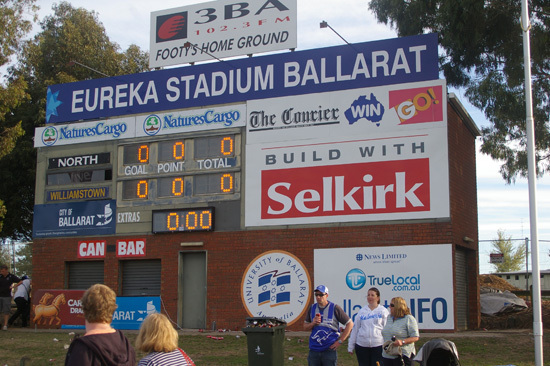 Ballarat is quite familiar with rain, so the playing surface is usually well grassed. Mud is no stranger. The scoreboard is utilitarian like the ground it serves. It lacks aesthetics but compensates with sponsorship, as you can see. These shots were taken during an AFL practice match in February. 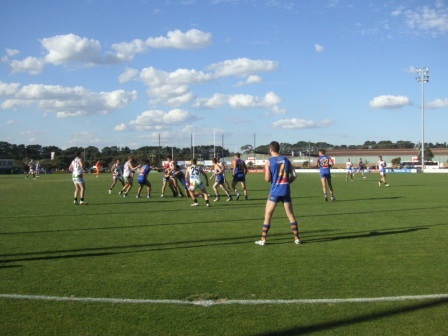 North Ballarat and Williamstown had played the preliminary game. The scoreboard remained resolutely unchanged for the main game. Local demarcation apparently pays no heed to uppity Melbourne clubs. North Melbourne maintains a strong relationship with the Roosters (the clubs are partially-aligned, in AFL/VFL terms), and the city has ambitions to host AFL games in the future. A complete redevelopment of the ground would be required for that to eventuate. Ballarat was founded on miners’ dreams of gold, so dreams don’t die easily around here. In the meantime the Roosters will continue to ply their trade through winter to the backdrop of gravel and rusting metal. You don’t notice the scenery if your eye is on the ball. 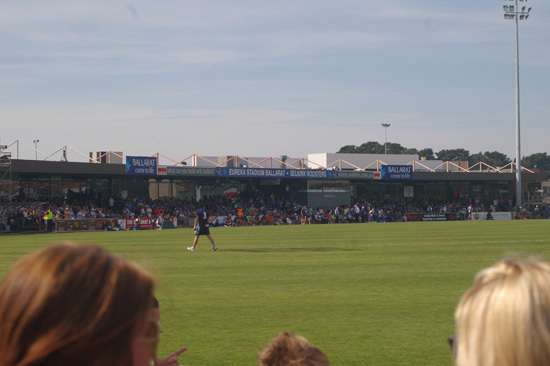 Williamstown had a rare win at Eureka Stadium on Saturday 14 April, with former Rooster Brett Goodes starring for the Seagulls. The scoreboard was back in action, though it wasn’t a pretty sight for the locals. 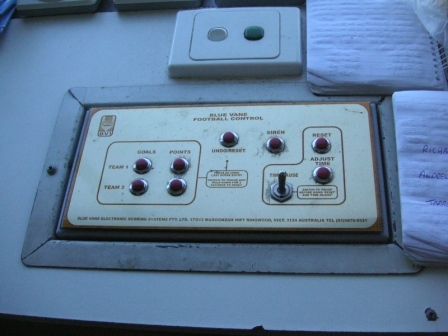 The scoreboard is operated from the small timekeepers’ box on the other side of the ground. North Ballarat was formed in 1882. Its first flag was 100 years ago in a four team competition. It dominated the Ballarat Football League from 1970 through to the club joining the VFL in 1996. Thanks to Roosters stalwart Stanley Digger Roberts. 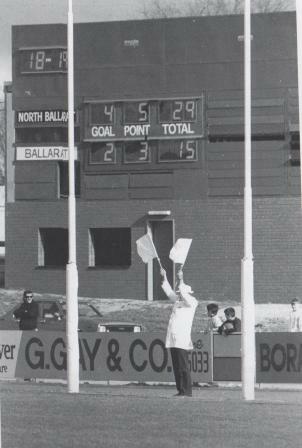 Black and white scoreboard photo courtesy of North Ballarat Football Club.